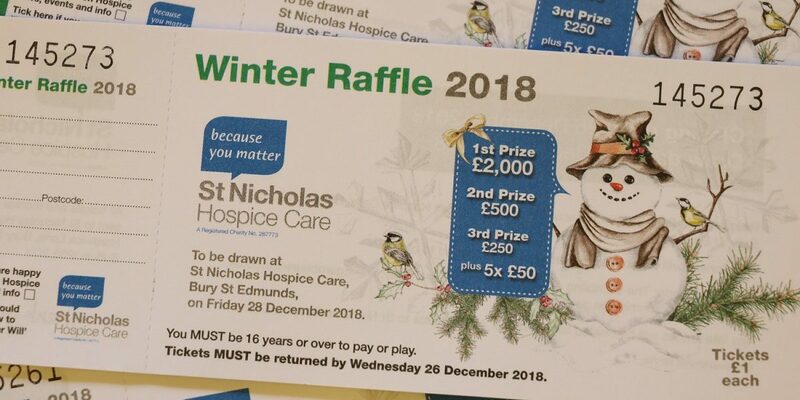 St Nicholas Hospice Care runs two big raffles a year, which return a large amount of funds that we simply could not do without. With cash and donated prizes on offer, we hope you can take part. Please contact us if you are not already on our mailing list, so that we can mail you the raffle packs twice yearly. (You can call 01284 715566 or email Raffles@stnh.org.uk to do this). The draw takes place on Friday, 28 December, and the winners will be notified within ten days of the draw date. The winners of the prize amounts will receive their cheques automatically within 10 working days of the draw, so don’t worry about claiming them. We hope you will take part in our raffles. The money received helps fund the services and care the Hospice provides. And you could be a winner too!